Chattanooga, TN doesn't seem like a city that would have and something beneath it. It is a small, Southern city. 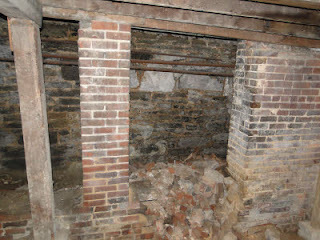 However, beneath the streets of Chattanooga, there is a forgotten, haunted city. In March of 1867, the city of Chattanooga was completely flooded. The city streets were totally submerged and everything grinded to a halt. In order to get from one building to the next, residents and tourists had to travel by boat. This was a disaster on an epic scale, dozens of people died, livestock was lost and homes drifted away in the water. It was a catastrophe and during these times there was no help. Residents had to wait it out and pray that none of their loved ones vanished with the constantly moving waters. This wasn't the first time Chattanooga had flooded. The city had flooded two times prior and residents were desperate for a solution. According to Chattanooga writer, Cody Maxwell, sometime during this disaster the city came up with the idea of raising the streets of the city. It seems that the flooded and waterlogged citizens decided that if they just raised half the city streets up 20ft it would take care of the flooding because the water would be under the streets. Not only did they imagine this idea, they did it. All of this was very poorly documented and it wasn't until one gentleman noticed that the top parts of windows and doors were sticking out of the street that anyone remembered that a large portion of Chattanooga was under the street. Twenty feet beneath Market street there is an entire city waiting to be discovered. This underground city is a regular stop on the Chattanooga ghost walk. According to the Chattanooga Ghost Tours owner, Amy Petulla, there is an entire city of ghosts under the streets of Chattanooga buried beneath the roads like part of the lost city. Amy Petulla regularly takes groups to parts of the underground to tell them about the haunted history of the city. She says that this is the most haunted part of the city and visitors have claimed to have been pushed, bitten, and grabbed in Underground Chattanooga. Amy wrote a book about the ghosts of Chattanooga called, Haunted Chattanooga, and many of her terrifying stories of the things that happen beneath the streets can be found there. wow! can i come with? Nice, an entire city below another. I would be an interesting place to explore, and scary too. how fascinating! would love to see this! I'll post pictures in November! Fascinating! An American Mary King's Close (Edinburgh), revenant residents and all! Looking to your follow up. Bon weekend from a para loving (and living) ex pat Ulsterman in haunted northern France. "The Real Mary King’s Close is a warren of underground streets and spaces. It can be a strange concept to understand – back in the 1600’s, Mary King’s Close and neighbouring Closes were at the heart of Edinburgh’s busiest and most vibrant streets, open to the skies and bustling with traders selling their wares to the Old Town’s residents. Why would this street find itself underground 400 years later? For years, the hidden Closes of Old Town Edinburgh have been shrouded in myths and mysteries, with tales of ghosts and murders, and of plague victims being walled up and left to die. Research and archaeological evidence have revealed a much truer story, rooted in fact and – as is so often the case – more fascinating than any amount of fiction."